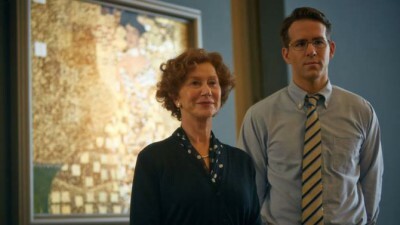 A mix of early 20th century Austrian music and masterful painting coupled with the Holocaust suffered by Jews under the Third Reich make for familiar flashbacks in a contemporary story of the late Maria Altmann (Helen Mirren) in “Woman in Gold.” Ms. Altmann escaped Nazi thuggery to live out her life in Los Angeles and was the niece of Adele Bloch-Bauer, the woman who sat for the famous Austrian artist, Gustav Klimt as he created his masterpiece, Portrait of Adele Bloch-Bauer I. That the Nazis stole Klimt’s well-known painting and the nation of Austria taking claim of it after WWII (rather than Altmann, sole heir of the family) fuels this excellent drama directed by Simon Curtis (My Week With Marilyn) and written by Alexi Kaye Campbell. The Austrian music takes its place in the film via the young lawyer that Altmann commissions to help her retrieve the Klimt creation. Ryan Reynolds plays the attorney; his name, E. Randol Schoenberg. That last name suggests to anyone who knows even a little bit about cutting edge music of the early 20th century that Randol must be kin to Arnold Schoenberg, the iconic Austrian composer of 12-tone music. Indeed Randol is. In fact, he’s Arnold’s grandson. Because of the rise fascism, the elder Schoenberg left Austria in 1934 and came to America as the Third Reich had decreed Schoenberg’s music “degenerate.” (Such irony, yes?) Schoenberg died in Los Angeles in 1951. Woman in Gold boasts an excellent cast along with Mirren and Reynolds. 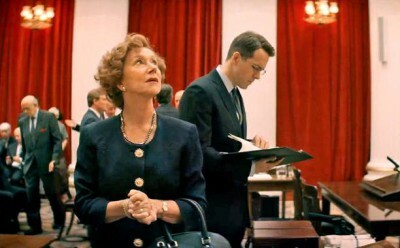 Daniel Bruhl plays the plaintiff’s contact in Vienna; Katie Holmes is seen as Randol’s young, pregnant wife in Los Angeles; Jonathan Price plays the brief but juicy role of William Rhenquist, then Chief Justice of the US Supreme Court and, surprise, surprise, Elizabeth (long time no see) McGovern shows up as a lower court judge (quite nicely, thank you) as the legal proceedings rise through the judicial system. Others in the cast include Charles Dance as Randol’s stern law firm boss, Tatiana Maslany as the young Maria, Max Irons as the man with whom Maria escapes Vienna and Antje Traue as Adele Bloch-Bauer. Ms. Traue looks very much like Ms. Bloch-Baer by the way. 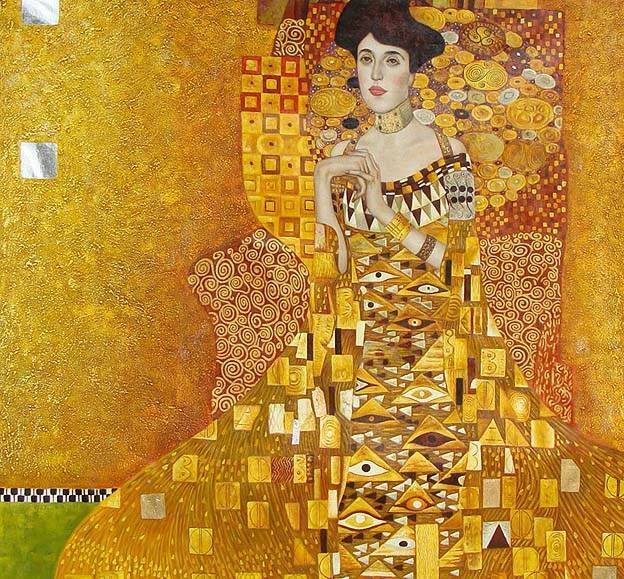 For a reprise, Klimt would likely be pleased with making a painting of Ms. Traue as well. Randol is shown in one scene in Woman in Gold attending a chamber music concert where his grandfather’s music is the major part of the program. I hasten to add that those who’ve not yet acquired their ear for 12-tone music, the sequence runs only about two or three minutes.